Although Android and Unity3D are both common topics here at 41post.com, this tutorial is the first one featured in this website to combine those two topics into a single post. The View used by Unity only takes part of the screen. The three buttons are native Android UI buttons. 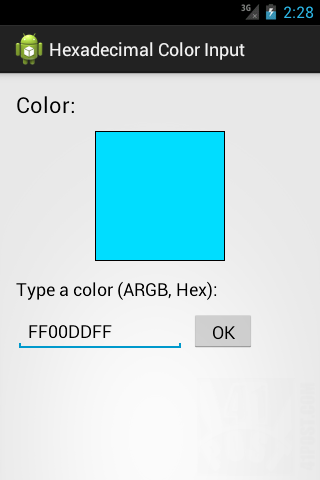 This Android programming tutorial shows how to create a simple application that takes the value of a hexadecimal color at an EditText field and displays it as an ImageView. In order to do so, this post goes into detail on how to correctly parse the EditText String as 32 bit hexadecimal Integer. Additionally, it explains the part of the code that constrains the characters between A to F and 0 to 9 at the EditText. Finally, it tries to solve some of the EditText problems when applying these constrains. The application in this post has been tested on Android 2.1, 2.3 and 4.0. A screenshot of the example project. It’s available for download at the end of the post. This post explains how to change the color of the standard Android button. It also shows how to change the color of the text inside those buttons. It goes into detail on how to create a ColorFilter effect that changes the color of the button using three different approaches . The code featured in this post has been tested on Android 2.1, 2.2, 2.3 and 4.0. Before starting, a little advice: know that changing the color of the standard Android button through XML is an easier and more straightforward approach. For that, please refer to the link Custom color buttons for Android (9-Patch). If the button color isn’t going to be changed after the application is initialized, then use XML. If that isn’t the case, then do it programmatically, which is what this tutorial focuses on. This post shows the necessary steps to obtain the correct String resource outside the Android XML namespace. It has been written specifically for dealing with string resources associated with Preferences inflated from XML files, so this post assumes that the reader is familiar with writing customized preferences for Android. Altought, it can probably be used on other situations. This code has been tested on an emulator running Android 2.1 and also on real devices running Android 2.1, 2.2 and 4.0.4. This post explains how to create a DialogPreference that allows the user to reset all preference values to their defaults. This post has been created and tested in both the emulator and on a real device running Android 2.1. Therefore, some method calls used in this example may be deprecated on newer Android versions.